Christiaan Huygens (1629-1695) was born this month. Charles Messier discovered the open cluster M50 in Monoceros on April 5, 1772. Charles Messier discovered the spiral galaxy M58 in Virgo on April 15, 1772. Johann Koehler discovered the elliptical galaxies M59 and M60 in Virgo on April 11, 1779. Caroline Herschel discovered C/1790 H1 (Herschel) on April 18, 1790. The first photograph of the Sun was taken on April 2, 1845. The first radar signal was bounced off of the Sun on April 7, 1959. The Hubble Space Telescope was placed in orbit on April 25, 1990. The Compton Gamma Ray Observatory achieved orbit on April 7, 1991. The Sun is located in Pisces on April 1. It enters Aries on April 19th. Brightness, apparent size, illumination, distance from the Earth in astronomical units, and location data for the planets and Pluto on April 1: Mercury (0.8, 9.4", 29% illuminated, 0.72 a.u., Aquarius), Venus (-3.9, 13.1", 81% illuminated, 1.27 a.u., Aquarius), Mars (+1.4. magnitude, 4.6", 94% illuminated, 2.02 a.u., Taurus), Jupiter (-2.2 magnitude, 39.8", 99% illuminated, 4.95 a.u., Ophiuchus), Saturn (+0.6 magnitude, 16.4", 100% illuminated, 10.16 a.u., Sagittarius), Uranus (+5.9 magnitude, 3.4", 100% illuminated, 20.85 a.u. on April 16th, Aries), Neptune (+7.9 magnitude, 2.2", 100% illuminated, 30.72 a.u. on April 16th, Aquarius), and Pluto (+14.3 magnitude, 0.1", 100% illuminated, 33.72 a.u. on April 16th, Sagittarius). Mars and Uranus are located in the west in the evening. Mercury, Venus, and Neptune can be found in the east, Saturn in the southeast, and Jupiter in the south in the morning sky. Observers in the southern hemisphere are favored during the current morning apparition of Mercury. Mercury has a close conjunction with Neptune on April 2nd. The speediest planet reaches aphelion on April 10th and is at greatest western elongation on April 11th. Mercury and Venus are approximately ten degrees apart on April 1st but that distance decreases fairly rapidly. 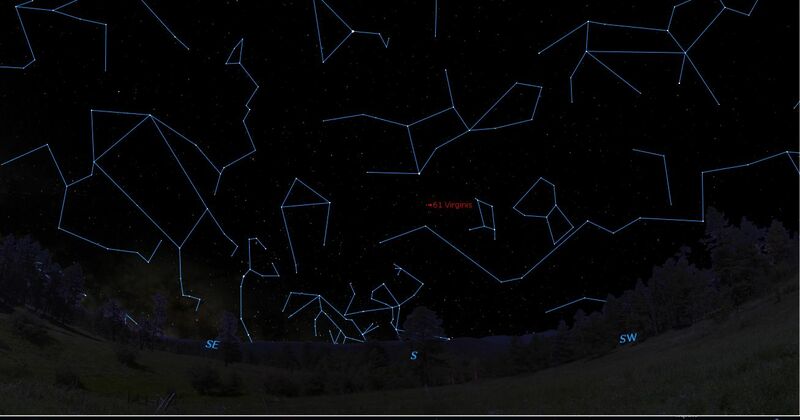 The two planets are in quasi-conjunction, a pairing with a separation of less than five degrees, on April 16th. This will be the first quasi-conjunction of Mercury and Venus in nearly three years. On the first day of April, Venus rises at approximately 5:30 a.m. local daylight time. On April 2nd, the waning gibbous Moon passes three degrees to the south of the waxing gibbous Venus. Venus joins Mercury in a quasi-conjunction on April 16th. As the month begins, Mars sets more than four hours after sunset. It fades from magnitude +1.4 to +1.6 and shrinks to just 4.2 arc seconds by the end of April. The Red Planet passes between the large open clusters Melotte 25 (the Hyades) and M45 (the Pleiades) during the first week of April. It lies three degrees south of M45 on April 1st. On April 8th, a waxing crescent Moon lies six degrees south of Mars and eight degrees west of Aldebaran. The Red Planet passes seven degrees north of Aldebaran on April 16th and crosses the sixth-magnitude open cluster NGC 1746 ten days later. Jupiter increases in brightness from magnitude -2.2 to magnitude -2.4 and in apparent diameter from 39.8 to 43.4 arc seconds during April. As the month begins, Jupiter rises just before 1:30 a.m. local daylight time. On April 10th, Jupiter reaches its first stationary point. Four months of retrograde or western motion will follow. A waning gibbous Moon passes within two degrees of Jupiter on the morning of April 23rd. The Galilean satellite Io undergoes shadow transits starting at 3:25 a.m. EDT (7:25 UT) on April 2nd, 5:19 a.m. EDT (9:19 UT) on April 9th, 1:41 a.m. EDT (5:41 UT) on April 18th, and 3:34 a.m. EDT (7:34 UT) on April 25th. On April 26th, Europa’s shadow first falls on Jupiter at 3:33 a.m. EDT (7:33 UT). Ganymede emerges from eclipse 22 arc minutes west-southwest of Jupiter’s limb and 26 arc minutes south of Europa beginning at 4:02 a.m. EDT (8:02 UT) on April 12th. Since Jupiter is currently inclined three degrees with respect to the Earth, Callisto, the most distant of the Galilean satellites, does not appear to cross the planet’s disk. It is near Jupiter’s south pole on April 6th and near its north pole at dawn on April 14th. Data on other Galilean satellite events is available at http://www.skyandtel...watching-tools/ and page 51 of the April 2019 issue of Sky & Telescope. For information on transits of Jupiter’s central meridian by the Great Red Spot, consult https://www.projectp...eve_grs.htm#apr or page 50 of the April 2019 issue of Sky & Telescope. Saturn rises at approximately 3:00 a.m. local daylight time as April begins. The Ringed Planet rises by 1:15 a.m. local daylight time, brightens to magnitude +0.5, and subtends 17 arc seconds by the end of the month. At midmonth, its rings span 38 arc seconds and are tilted 24 degrees with respect to the Earth. Saturn is occulted by the Moon from some parts of the world on April 25th. The planet reaches its first stationary point and begins retrograde motion on April 30th. Titan, Saturn’s brightest satellite at eighth magnitude, passes 1.1 arc minute south of the planet on April 2nd and April 18th and 1.1 arc minute north of the planet on April 10th and April 26th. Iapetus is located 1.1 arc minutes south of Saturn and shines at eleventh magnitude on April 7th. By the time this odd moon, which has a dark side and a bright side, reaches greatest elongation nine arc minutes from Saturn on April 28th, it brightens to tenth magnitude. Browse http://www.skyandtel...watching-tools/ for information on Saturn’s satellites. Uranus is in conjunction with the Sun on April 22nd and consequently is not visible after the first few days of this month. Eighth-magnitude Neptune is very low in the east at dawn. Venus passes 0.3 degree south of the distant planet on the morning of April 10th. The two planets are only seven degrees in altitude 30 minutes before sunrise. The fourth-magnitude star Phi Aquarii is positioned just five arc minutes south of Neptune on that date. Comet C/2018 Y1 (Iwamoto), at tenth magnitude and fading fast, is the brightest comet visible this month. It can be found in eastern Perseus. Visit http://cometchasing.skyhound.com/ and http://www.aerith.ne...ly/current.html for information on this month’s comets. The fifth-magnitude G-type main-sequence star 61 Virginis - http://www.solstatio...rs/61vir2co.jpg - is a sun-like star at a distance of 28 light years. It hosts three exoplanets and is visible to the naked-eye. Telrad finder charts for the Messier Catalog and the SAC’s 110 Best of the NGC are posted at http://www.astro-tom...charts/map1.pdf and http://www.saguaroas...o110BestNGC.pdf respectively.